For the last couple of weeks, a lot of work has been going into developing the scripting API that the engine is exposing to Lua. Embedding a scripting language into a large C++ codebase has been a very interesting experience and I’ve been able to experience first hand why Lua is regarded as such a strong scripting language. Introspection of an Entity from a Lua script running in the Console. Lua offers a myriad of ways we can develop a scripting interface for our native code. A naïve approach would be to expose every function of the engine in the global namespace and have scripts use these directly. Although this method would certainly work, we want to offer an object-oriented API to the engine and its different components, so a more elaborate solution is required. I ultimately decided to build the interface from scratch, following the Lua concepts of tables and metatables. The reason being that building everything myself would allow me to clearly see the costs of the binding as objects are passed back and forth. This will help keep an eye on performance. 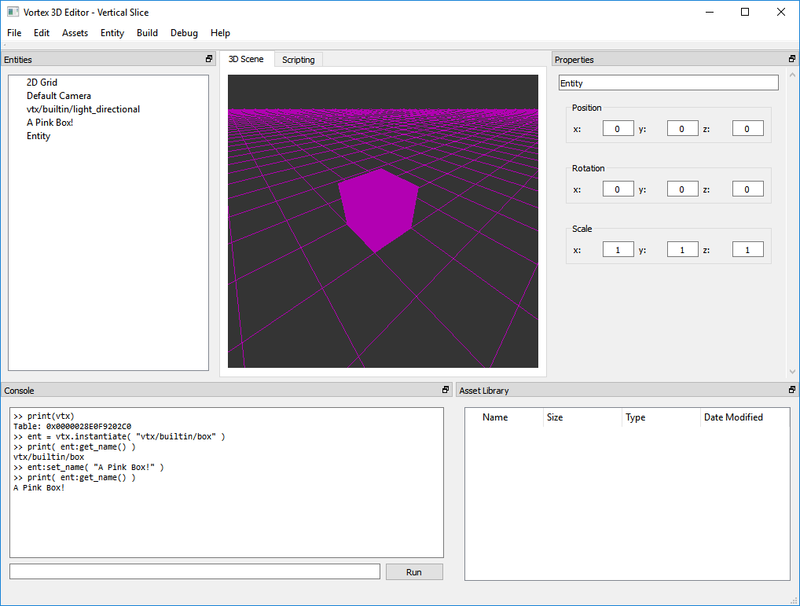 Initial Test of the Lua-C++ binding. In this example, we query and rename an Entity. In order to keep the global namespace as clean as possible, the idea was to create a Lua Table procedurally from the C++ side where all functions and types would live. Conceptually, this table is our namespace, so I named it vtx, accordingly. It’s really the only global variable that the engine registers. vtx.instantiate( string ) -- Create a new entity corresponding to the identifier passed. -- Return the new entity created. vtx.find_first_entity_by_name( string ) -- Find the first entity in the scene that matches the name specified. -- Return the entity or nil if no matches are found. -- Create a new entity corresponding to the identifier passed. -- Return the new entity created. -- Find the first entity in the scene that matches the name specified. -- Return the entity or nil if no matches are found. We now have functions. But how do we do objects? And how do we expose our vtx::Entity objects to Lua? Let’s recap a bit. We know that entities are “engine objects”, in the sense that they live in C++ and their lifecycles are managed by the Vortex Engine. 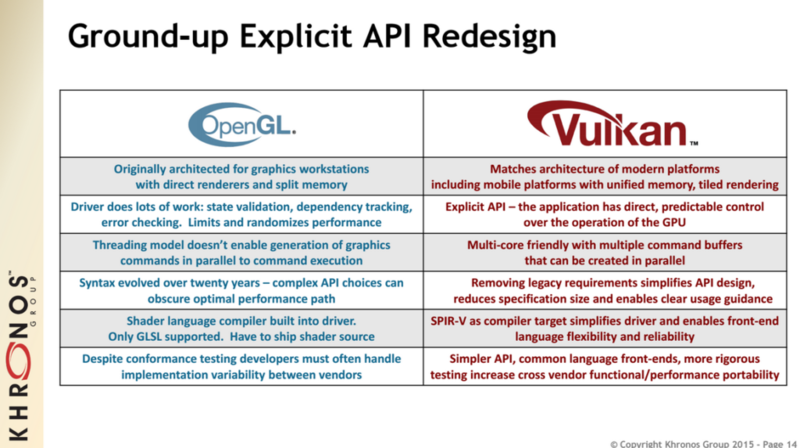 What we want is to provide a lightweight object that Lua can interact with, but when push comes to shove, the native side will be able to leverage the full C++ interface of the engine. Lua offers the concept of a metatable that helps achieve this. Metatables are can be associated to any table to provide special semantics to them. One special semantic we are interested in is the __index property, which allows implementing the Prototype design pattern. I won’t go into details of the the Prototype design pattern works, but suffice it to say that whenever a function is called on a table, and the table does not have an implementation for it, the prototype will be responsible to service it. This is exactly what we want. What we can do then is wrap our vtx::Entity instances in Lua tables and provide a common metatable to all of them that we implement in the C++ side. Even better, because of this approach Lua will take care of passing the Entity Table we are operating on as the first parameter to every function call. We can use this as the “this” object for the method. From the native side, we create a metatable. Call it vtx.Entity. We register in this metatable a C++ function that receives a table and a string and can set the name of a native Entity. We assign it to the “set_name” property of the metatable. Set the table’s metatable to vtx.Entity. Store a pointer to the C++ Entity in it. When a script invokes the Entity’s set_name function, it will trigger a lookup into the metatable’s functions. The function we registered under set_name will be called. We are now back in C++. The native function will pop from the stack a string (the new name) and the “Entity” on which the method was called. We reinterpret_cast the Entity Table’s stored pointer as a vtx::Entity pointer and call our normal setName() function, passing down the string. Et voila. That is everything. The second image above shows in the console log how all this looks to a Lua script. At no point must the script developer know that the logic flow is jumping between Lua and C++ as her program executes. We can also see in the screenshot how the Editor’s entity list picks up the name change. This shows how we are actually altering the real engine objects and not some mock Lua clone. As I mentioned in the beginning of this post, developing a Lua binding for a large C++ codebase from scratch is a lot of fun. I will continue adding more functionality over the coming weeks and then we’re going to be ready to go back and revisit scene serialization. I came across this video that provides a great introduction to the Qt Quick controls in Qt 5. It’s very interesting to see how a fully fledged, cross platform app that consumes a Web API can be developed in just over 15 minutes almost without a single line of code. After seeing this video, I’ve been looking a little more into how C++ can be integrated into Qt Quick apps and, unfortunately, it doesn’t seem to leverage the signal-slot mechanism common to QWidgets applications. This is a problem, since it means that reusing a large codebase might be a little more involved than just doing a seamless transition from writing QWidgets to slowling rolling out side-by-side Qt Quick panels. Nonetheless, it’s very impressive and it’s definitely worth taking a look at if you need to develop a quick desktop UI in 10~15 minutes. This week, we’re back to developing new native components for the Vortex Engine. For this week, the objective was to develop a “Waypoint Tween” component that moves an entity’s position between a series of points. There are two main aspects to bringing the system to life: the component implementation in the Vortex Engine and the UI implementation in the Vortex Editor. At the engine level, the system is implemented via a C++ component that is very fast at the time of performing the math necessary to interpolate point positions based on time and speed. At the editor level, due to the flexibility of this system, exposing its properties actually required a significant amount of UI work. 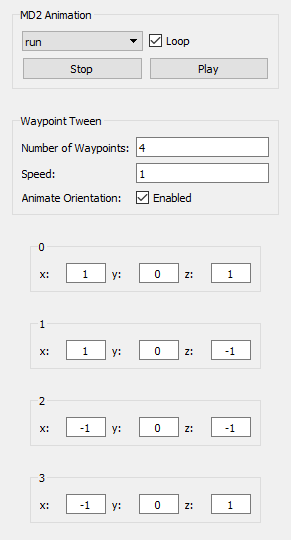 In this first iteration, points can be specified directly in the component properties of the inspector panel. Later in the game, the the plan is to allow the user to specify the points as actual entities in the world and then reference them. Now, in the animated GIF above, it can be seen that the 3D model is not only moving between the specified points, but it also appears as if the model is running between these. There are two factors at play here to implement this effect: the MD2 Animation and the Waypoint Tween. The MD2 Animation and Waypoint Tween Components. When enabled, the Animate Orientation property of the Waypoint Tween component orients the 3D model so that it’s looking towards the direction of the point it’s moving to. This propery is optional, as there are some cases where this could be undesirable, for instance, imagine wanting to implement a conveyor belt that moves boxes on top of it. It would look weird if boxes magically rotated on their Oy axis. For a character, on the other hand, it makes complete sense that the model be oriented towards the point it’s moving to. Regarding the run animation, if you have been following our series on the Vortex Editor, you will remember that when instantiated by the engine, MD2 Models automatically include an MD2 Animation Component that handles everything related to animating the entity. More details can be found in the post where we detail how MD2 support is implemented, but the idea is that we set the animation to looping “run”. When we put it all together, we get an MD2 model that is playing a run animation as it patrols between different waypoints in the 3D world. So how can the waypoint system be used in practice? I envision two uses for the waypoint system. The first one is for environment building. 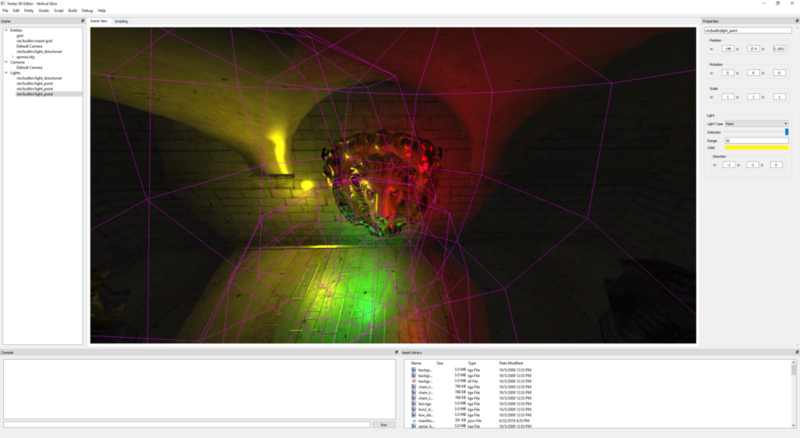 Under this scenario, the component system is used to animate objects in the background of the scene. Case in point, the conveyor belt system described above. The second use, which might be a little more involved, would be to offload work from scripts. 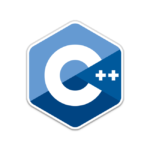 The efficient C++ implementation of the waypoint system would allow a component developed in a scripting language to have an entity move between different points without having to do the math calculations itself. The dynamic nature of the component would allow this script to add and remove points, as well as interrupting the system at any time to perform other tasks. An example would be a monster that uses the waypoint system to patrol an area of the scene and then, when it’s detected that a player is close to the monster, the system is interrupted and a different system takes over, perhaps to attack the player. I had a lot of fun implementing this system, as it brings a lot of options to the table in terms of visually building animated worlds for the Vortex Engine. The plan for next week is to continue working on the Editor. There is some technical debt on the UI I want to address in order to improve the experience and there are also a couple of extra components I want to implement before moving on to other tasks. As usual, stay tuned for more! 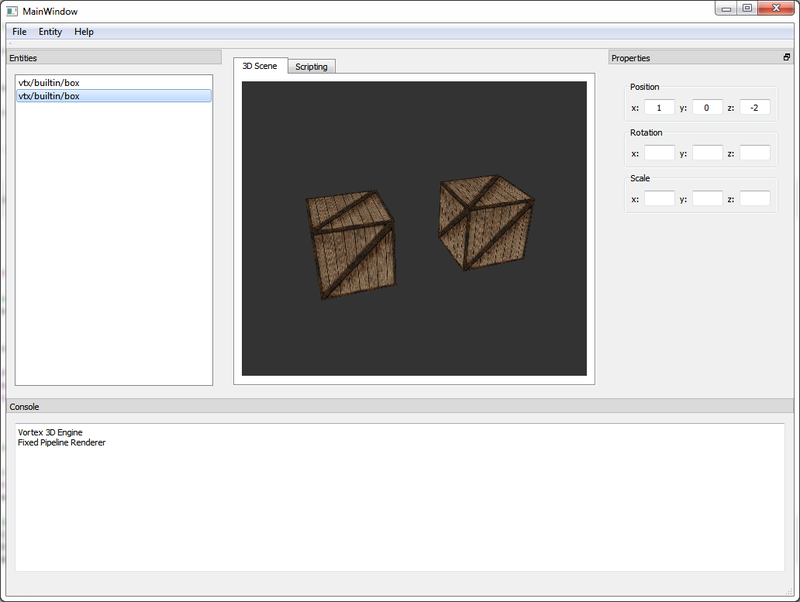 This week I started implementing the properties panel (sometimes called the “inspector” panel) for the Vortex Editor. The redesigned Transformation Panel in the Vortex Editor vertical slice. I originally wanted to go with a table design for the UI. I though it would give me the flexibility of adding as many editable entries as necessary. I even implemented a mockup in the UI that can be seen in previous screenshots of the Editor. The problem that I found however was that both, the difference in font and text spacing, between the left and right panels of the UI made the layout look uneven. I knew I wanted something more symmetrical for what’s essentially the “home” view of the Editor, so I came up with a new design that can be seen in the image above. Here, the Transform Panel consists in a custom UI component that is created dynamically and parented to the docked panel on the right. This provides a more uniform layout with two advantages: first, any number of property panels can be created and they will be nicely stacked one after the other in the panel (this will be useful in the future). Second, because the properties panel is detachable, it still allows the user to customize the Editor layout to her liking. Now, one minor roadblock I’ve encountered from the engine standpoint for fully realizing this idea is the way Vortex currently represents Entity transformations. All transformations in Vortex are represented as a 4×4 Matrix. 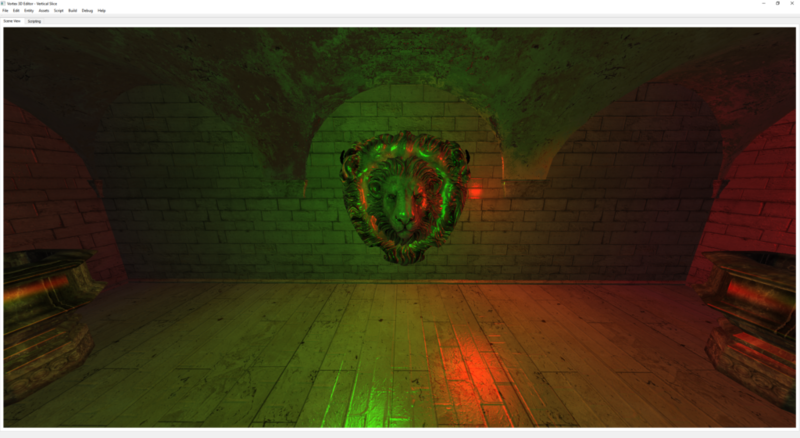 The driving force behind this decision was to avoid having to convert between rotation representations at render time, thus saving some time down the line at during any scenegraph traversal passes. So what does a generic transformation matrix look like in Vortex? In this matrix, (tx, ty, tz) correspond to the translation component of the Entity and we can easily extract this information to populate the Transformation Panel. But what happens with the rotation and scale? Rotation and Scale are mixed in together in the matrix (represented by the overlapping sr components), so we can’t really extract the original scale and rotation that generated this matrix. This means that we will only be able to show and edit the position of the Entity and not its rotation or scale. This is a limitation that has to be lifted. The plan is to provide a higher-level contraption for describing transformations. Indeed a Transform class that will keep separate tabs for position, rotation and scale but will also provide a convenience method for computing on-demand the transform matrix that this transform represents. I think this will be a good change for the Engine. Working with Entities using a position-rotation-scale mindset instead of having to the deal with the cognitive overhead of thinking in terms of representing these as matrix operations will help users be more productive (and save precious keystrokes). This coming week I will be working on finalizing this implementation and finally exposing full Entity transformation control through the UI. Stay tuned! 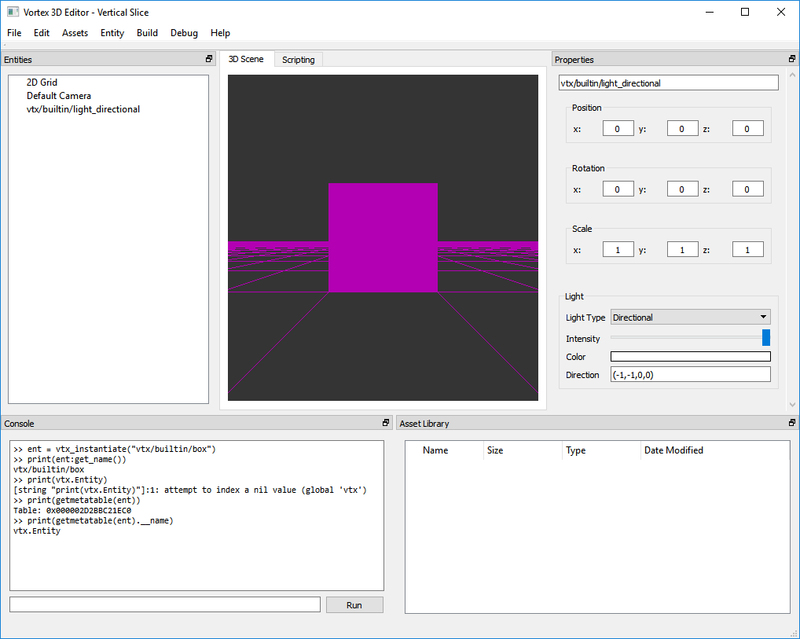 This week we take a break from work in the Vortex Editor to revisit an older personal project of mine: the GLSL Shader Editor, a custom editor for OpenGL shaders. 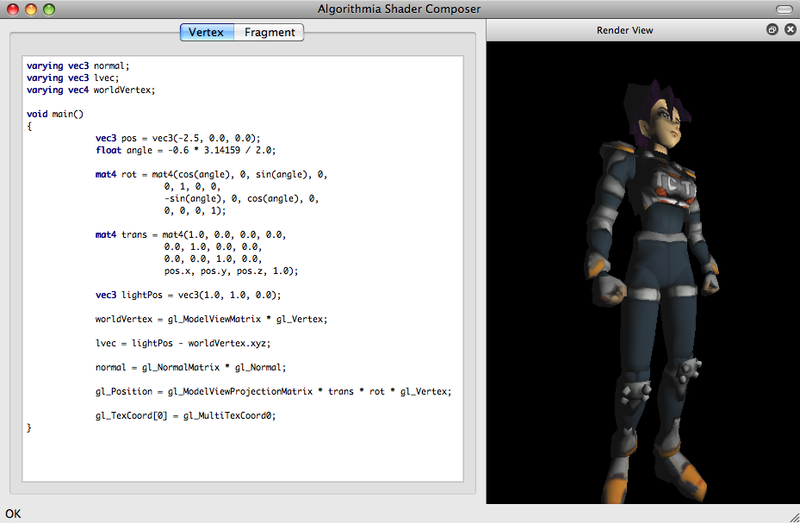 The UI of my custom shader editor. The idea of the editor was to allow very fast shader iteration times by providing an area where a shader program could be written and then, by simply pressing Cmd+B (Ctrl+B on Windows), the shader source would be complied and hot-loaded into the running application. This concept of hot-loading allowed seeing the results of the new shading instantly, without having to stop the app and without even having to save the shader source files. 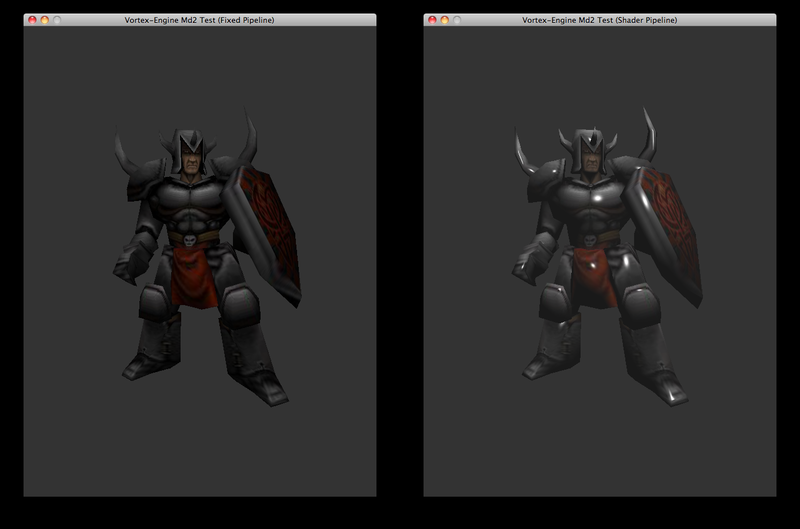 This allowed for very fast turn-around times for experimenting with shader ideas. As the image above shows, the UI was divided in two main areas: an Edit View and a Render View. The Edit View consisted in a tabbed component with two text areas. These text areas (named “Vertex” and “Fragment”) are where you could write your custom vertex and fragment shaders respectively. 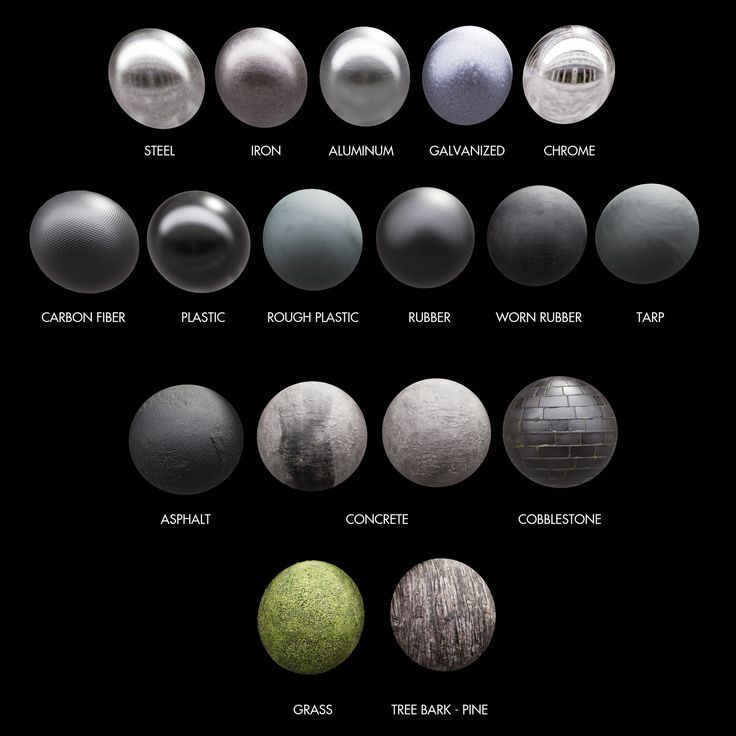 The contents of these two would be the shader source that was be compiled and linked into a shader program. 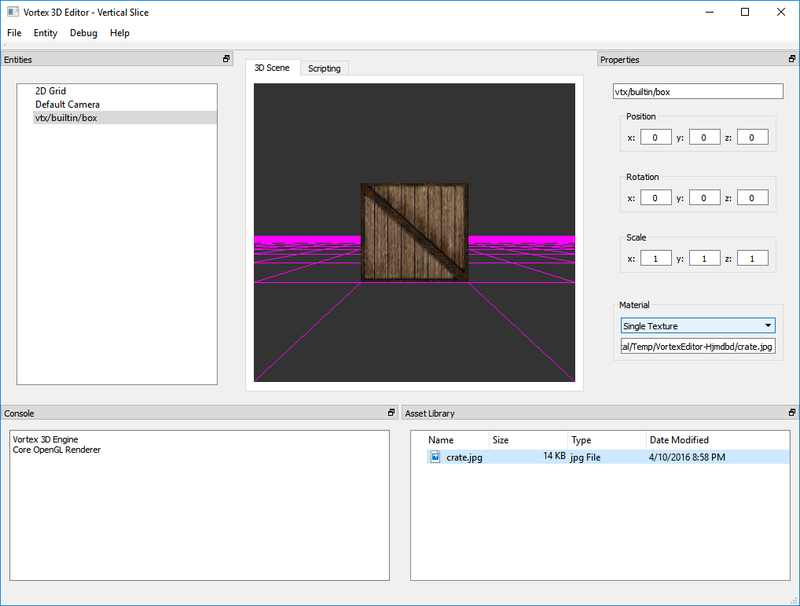 The shader program would be compiled by pressing Cmd+B and, if no errors were found, then it would be hot-loaded and used to shade the model displayed in the Render View. The status bar (showing “OK” in the image), would display any shader compilation errors as reported by the video driver. 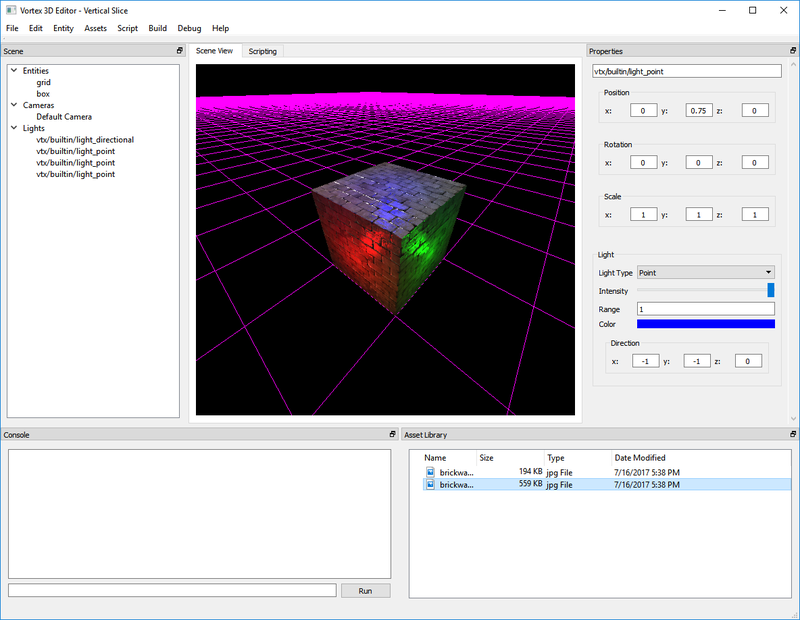 The application had a number of built-in primitives and it also allowed importing in models in the OBJ format. It was developed on Ubuntu Linux and supported MS Windows and OS X on a number of different video cards. Supported platforms: (Ubuntu) Linux, MS Windows, OSX. Diverse set of visual primitives and OBJ import support. Very efficient turn-around times by hot-loading the shader dynamically – no need to save files! 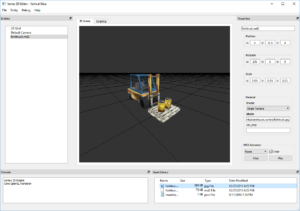 Interestingly, this project was developed at around the same time that I got started with the Vortex Engine, therefore, it does not use any of Vortex’s code. 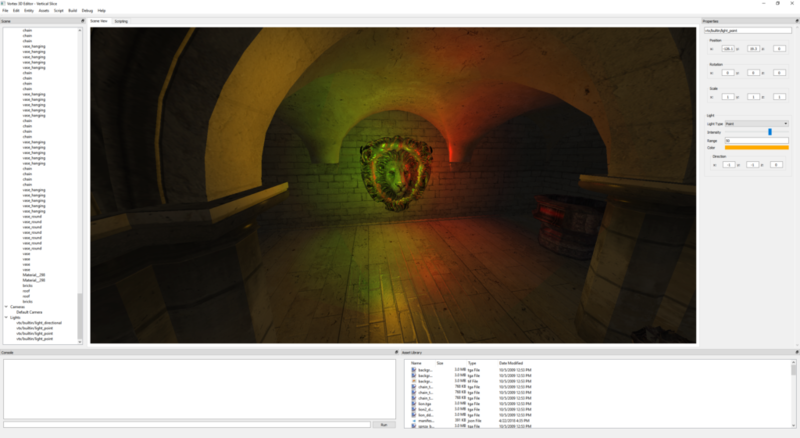 This means that all shader compiling and loading, as well as all rendering was developed from scratch for this project. I’ve added a project page for this application (under Personal Projects in the blog menu). I’ve also redesigned the menu to list all different personal projects that I’ve either worked on or that I’m currently working on, so please feel free to check it out. Next week, we’ll be going back to the Vortex Editor! Stay tuned for more!